The single reached number one in the United Kingdom, the United States, Ireland, Canada, New Zealand, Australia, France, West Germany, and Mexico. It was the Beatles’ only single that credited another artist at their request. “Get Back” was the Beatles’ first single release in true stereo in the US. In the UK, the Beatles’ singles remained monaural until the following release, “The Ballad of John and Yoko“. “Get Back” is unusual in the Beatles’ canon in that almost every moment of the song’s evolution has been extensively documented, from its beginning as an offhand riff to its final mixing in several versions. Much of this documentation is in the form of illegal (but widely available) bootleg recordings, and is recounted in the book Get Back: The Unauthorized Chronicle of the Beatles’ Let It Be Disaster by Doug Sulpy and Ray Schweighardt. On 23 January, the group (now in Apple Studios) tried to record the song properly; bootleg recordings preserve a conversation between McCartney and Harrison between takes discussing the song, and McCartney explaining the original “protest song” concept. The recording captures the group deciding to drop the third verse largely because McCartney does not feel the verse is of high enough quality, although he likes the scanning of the word “Pakistani“. Here the song solidifies in its two-verse, three-solo format. Billy Preston joined the Beatles on keyboards from 22 January, having been recruited by Harrison partly with a view to deter bickering among the Beatles. The group with Preston playing Fender Rhodes electric piano recorded about ten takes on 23 January. On 27 January they made a concerted effort to perfect “Get Back“, recording about 14 takes. By this time the song had the addition of a false ending and reprise coda. After numerous takes the band jammed some old numbers and then returned to “Get Back” one last time in an attempt to record the master take. This performance (Take 11) was considered to be the best yet – it was musically tight and punchy without mistakes, though the song finishes without the restart. On the session tape, George Harrison comments “we missed that end“; this is the version heard on the Let It Be… Naked album. On 28 January the group attempted to recapture the previous day’s performance and recorded several new takes each including the coda. Whilst these takes were good, they did not quite achieve the quality of the best take from the previous day. The line-up for the released versions of “Get Back” was Paul McCartney, lead vocal and bass; John Lennon, lead guitar and backing vocal; George Harrison, rhythm guitar; Ringo Starr, drums; and Billy Preston, electric piano. Harrison, the usual lead guitarist, had temporarily quit the group on 10 January, so Lennon worked out the lead guitar. The Beatles had EMI produce a mono remix of the track on 4 April, completed by Jeff Jarrett. The Beatles were unhappy with the mix and on 7 April McCartney and Glyn Johns worked at Olympic Studios to produce new remixes for the single release. They made an edited version using the best take of the main part of the song (take eleven) from 27 January and the ‘best coda’ ending from 28 January. The edit is so precise that it appears to be a continuous take, achieving the ending the Beatles had desired all along. This was a divergence from the concept of straight live performance without studio trickery, but a relatively minor one, and avoids the somewhat abrupt ending of the version that is used on the Let It Be… Naked album. The Beatles performed “Get Back” (along with other songs from the album) as part of the Beatles’ rooftop performance, which took place on the roof of Apple Studios in Savile Row, London on 30 January 1969, an edited version of which was included in the Let It Be film. “Get Back” was performed in full three times. During the third, which marked the end of the rooftop performance, the Beatles were interrupted by the police who had received complaints from office workers nearby. After the police spoke to Mal Evans, he turned off Lennon and Harrison’s amplifiers only for Harrison to switch them back on, insisting that they finish the song. It was during this period that McCartney ad-libbed, “You’ve been playing on the roofs again, and that’s no good, and you know your Mummy doesn’t like that … she gets angry … she’s gonna have you arrested! Get back!” The third rooftop performance of “Get Back” is available on Anthology 3: the last song of the Beatles’ final live performance. At the end of the last rooftop performance of “Get Back“, the audience applauds and McCartney says “Thanks, Mo” in reply to Maureen Starkey’s cheering. Lennon adds: “I’d like to say thank you on behalf of the group and ourselves and I hope we’ve passed the audition“. Spector used some of the talk preceding the master take of 27 January and edited on these comments to make the album version sound different from the single. The stereo single version, and that of the b-side, “Don’t Let Me Down“, were the first Beatles’ recordings to feature Starr’s drum kit in true stereo, mixed across the left and right channels. This utilised the then-fairly new 8-track recording technology and was a result of the growing popularity of stereo over mono. The only other Beatles’ track to employ this recording method was “The End” on Abbey Road. On 11 April 1969, Apple Records released “Get Back” as a single in the United Kingdom, paired with “Don’t Let Me Down” on the B-Side. The single began its seventeen-week stay in the charts on 26 April at number one, a position it held for six weeks. It was the first Beatles single to enter the official UK singles chart at the top. In the United States, “Get Back” began its first of twelve weeks on the Billboard Hot 100 chart the week ending 10 May. Two weeks after the song’s chart debut it hit number one, where it stayed for five weeks. “Get Back” became the band’s 17th #1 song in the US, surpassing Elvis Presley’s previous record of 16 number ones. In both the United Kingdom and the United States, the single was released by Apple, although EMI retained the rights to the song as part of their contract. It was the only Beatles’ single to include an accompanying artist’s name, crediting “Get Back/Don’t Let Me Down” to “The Beatles with Billy Preston“. Neither Apple nor Capitol Records created a picture sleeve for the single – it was simply packaged in a sleeve stating “The Beatles on Apple“. Apple launched a print ad campaign for the song concurrent with its release showing a photo of the band with the slogan The Beatles as Nature Intended, indicating that the sound of “Get Back” harked to the group’s earlier days. The single version of the song contains a chamber reverb effect throughout and a coda after a false ending, with the lyrics “Get back Loretta / Your mommy’s waiting for you / Wearing her high-heel shoes / And her low-neck sweater / Get back home, Loretta.” This does not appear on the album version; the single version’s first LP appearance would come three years later on the 1967–1970 compilation. This version also appeared in the albums 20 Greatest Hits, Past Masters and The Beatles 1. It was also included in the original line-up of the proposed Get Back album that was scheduled to be released during the fall of 1969. In Britain and Europe “Get Back/Don’t Let Me Down” was the Beatles’ last single to be released in mono, but in the US the single was released in stereo. It was the Beatles’ first single to be released in true stereo instead of mono as part of the “stereo only” movement gaining force in 1969. In both versions the lead guitar played by Lennon is in the left channel and the rhythm guitar played by Harrison is in the right channel. The single was also released in the experimental PocketDisc format by Americom in conjunction with Apple and Capitol in the late 1960s. When Phil Spector came to remix “Get Back” he wanted to make it seem different from the version released as the single, though both versions were the same take. The previous unreleased Get Back albums included elements of studio chatter to add to the live feel of the recordings. In this spirit, Spector included part of the studio chatter recorded immediately before a take recorded on 27 January, slightly crossfaded it onto the beginning of the same master take (recorded on January 28), and added McCartney and Lennon’s remarks after the close of the rooftop performance. This created the impression that the single and album versions are different takes. The single’s reverb effect was also omitted from the remix. In 2003, “Get Back” was re-released on the Let It Be… Naked album, remixed by independent producers with the sanction of the surviving ex-Beatles Paul McCartney and Ringo Starr, with John Lennon’s and George Harrison’s widows. The “naked” version of “Get Back” is ostensibly a cleaned up version of the single version albeit much shorter as there is a fade immediately before the final “whoo” and coda. Apple also prepared a specially-created music video of the Let It Be … Naked release of the song to promote that album in 2003. This video is edited together using stock footage of the band, along with Billy Preston, George Martin and others. In 2006 a newly mixed version of “Get Back” produced by George Martin and his son Giles was included on the album Love. This version incorporates elements of “A Hard Day’s Night” (the intro chord), “A Day in the Life” (the improvised orchestral crescendo), “The End” (Ringo Starr’s drum solo, Paul McCartney’s second guitar solo, and John Lennon’s last guitar solo), and “Sgt. Pepper’s Lonely Hearts Club Band (Reprise)” (Take 1’s drum count-off intro). However, there are several edits in this piece, including an extended intro, and the second verse is removed completely. 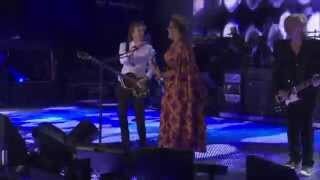 McCartney performed “Get Back” on the Late Show with David Letterman on 15 July 2009. Letterman’s show was taped in the Ed Sullivan Theater, the same theatre that hosted the Beatles’ performances on The Ed Sullivan Show in 1964 and 1965. McCartney’s performance was not on the stage, however. Instead, he performed atop the theatre’s marquee overlooking Broadway. In the interview preceding the performance, Letterman asked McCartney if he had ever played on a marquee before. “I’ve done a roof,” McCartney replied, referring to the Beatles’ 1969 performance atop the Apple Corps building in London. 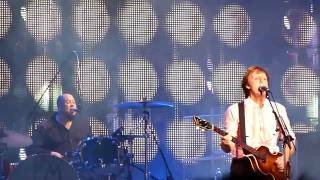 McCartney also performed the song as a kind of encore on Saturday Night Live on 11 December 2010. 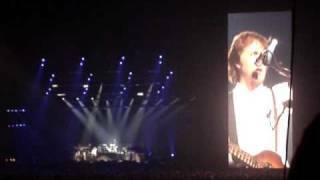 The performance was unusual for the show because McCartney had played the two standard songs that musical guests play, then had played a third song (“A Day in the Life“). 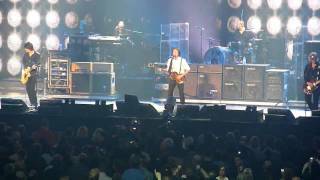 At the normal conclusion of the show, when host Paul Rudd thanked the cast, McCartney took the stage again for “Get Back“, the broadcast of which was partially cut off due to time constraints. [a] mono 7 Apr 1969 at Olympic Sound. edited. UK: Apple R5777 single 1969. CD: EMI single 1989. [b] stereo 7 Apr 1969 at Olympic Sound. edited. UK: Apple PCSP 718 The Beatles 1967-1970 1973. US: Apple 2490 single 1969, Apple SKBO-3404 The Beatles 1967-1970 1973, Capitol SV-12245 20 Greatest Hits 1982. [c] stereo 26 Mar 1970. edited. The exact recording date is still not resolved. Lewisohn says the version with the coda as heard in [a] and [b] is from Jan 28; Sulpy and Schweighardt confirm that this is the date of the coda alone but date the body of the song to Jan 27, and I’m following that for now. This may have to be changed later. The mono and stereo versions [a] [b] for the single are similar. After a pause, after a high “woo”, they continue into a coda with half-spoken words into a fadeout. Mono [a] fades slightly longer, but [b] is heard a second longer than usual on Capitol’s “20 Greatest Hits”. The mono mix was first issued worldwide on a 3-inch CD single in 1989. The take of the main body of the song actually ends with the “woo”. The March 1969 stereo mix (as heard on bootleg) ends there, with off-mike talking, and continues a few seconds into silence and a guitar noise. The unreleased “Get Back” albums compiled later use the [b] from the stereo single, and, as a reprise at the end, they use more from the same take as the coda (Jan 28?). The “Phil Spector version” [c] is edited after the “woo” into speech recorded 30 Jan 1969, at the end of the last “rooftop” performance of Get Back: “(cheers) Thanks Mo. . . we hope we passed the audition”. The speech at the beginning with “Rosetta” belongs there as part of the body (Jan 27?) take, as evidenced again in the March 1969 mix, but the “Sweet Loretta Fart” verse has come in from another source unknown. 3:09 • Outtake	• D • Stereo	• [...] Owing to the distracting presence of the police, which prompted some ad-libbing by Paul at the end, there was little chance of this number (the third rooftop performance of Get Back) being too accomplished; indeed, it was further hampered by the early silencing of John and George's amplifiers - a matter quickly rectified by the guitarists - so for a while only Paul's bass, Ringo's drums and Billy Preston's keyboard are audible. All the same, this is an historic moment: the Beatles are singing the last song in their last live performance. 2:35 • Studio version	• A remix of the single version recorded on 27 January 1969; without the coda recorded on 28 January or framing dialogue from the studio and rooftop concert added to the album version. 2:05 • Studio version	• As reported, the track uses the opening guitar from "A Hard Day's Night", the drum and guitar solos from "The End", percussion from "Sgt. Pepper's Lonely Hearts Club Band (Reprise)", and the orchestral swell from "A Day in the Life". “Get Back” has been played in 328 concerts and 6 soundchecks.